I’m loving my new crock-pot/slow cooker which I bought for half price in a recent sale. I’ve used it more times in the past two weeks than I used my old one in the previous two years. Funny how having something shiny and new make you want to use it more! I love Lamb Shanks and thought I’d adapt my old recipe and give it a whirl. Well the results were outstanding. Melt in your mouth delish, so very yummy! And the best part was that the lamb shanks I used were huge so we had enough for three meals so we have eating them for the past two nights in a row and the rest is in the freezer for another time. I’m picking that it probably won’t last too long in the freezer! I’ve also featured this on Gluten Free Wednesdays. Large New Zealand lamb shanks all ready to do the slow cooker bake! 4 large lamb shanks – New Zealand Lamb or any organic, grass feed lamb. Trimed. My lamb shanks were very large, so if your lamb shanks are small or medium add more. 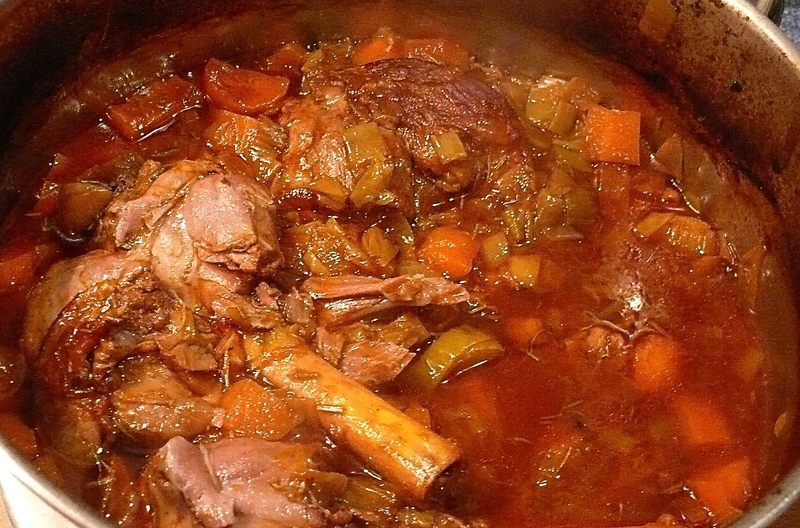 Remove lamb shanks from fridge and if you have time bring them to room temperature. If your shanks have not been prepared or trimmed it may be necessary to trim eg cut tendons. Add garlic , carrot, celery and leeks and fry until leeks are softish. Remove vegetables and place in the bottom of your slow cooker. Add the coconut oil to the pan and heat. Fry the lamb shanks until brown, turn each over to get all sides brown. Pour in your beef stock (or bone broth), salt, rosemary and cumin. Add balsamic vinegar & tomato paste. Cover cook for 6 – 8 hours on low. Uncover and turn to high while you are cooking your other veggies, just to thicken the sauce a bit. Serve with your favourite greens, mashed sweet potato or dreamy puréed cauliflower. If there there are any leftovers, this dish is even better reheated the next day or freeze for another day. Four shanks for 6 servings, are you eating children’s portions? you need one shank minimum for female diners and two per male diner; my male partner and I have three each, so six shanks one meal! A great comment, Ron. My lamb shanks were extra large, so I have updated the recipe to make the size of the lamb shanks clear. Many thanks for pointing this out!